For all but three members of our team, this SAISA experience was something that had never been experienced before. "Lincoln the hosts of SAISA Boys' Football" was something most of us never thought we would hear, but something Luke Davis also dreamed of. So as we stepped out, into the crowded gymnasium on the first day of the tournament and were met by the cheers of our peers and parents, it was as though we had, in part already achieved our goal. After the opening ceremony all the competing teams and the home crowd hopped on the Lincoln busses and headed to the Army Physical Training and Sports Centre in Lagankhel. 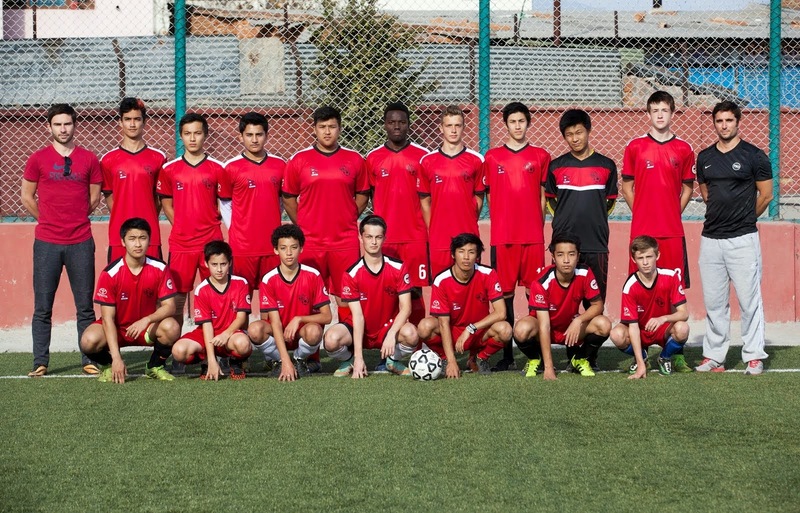 Lincoln's opening game was against the American International School of Chennai (AISC). A tense opening thirty minutes, with two injures to the Lincoln starting lineup, gave way to a more engrossing second half with Arahant Rajkarnikar scoring the opening goal of the tournament. Soon Lincoln doubled their lead through Pujen Shrestha only for AISC to grab a late consolation goal. As the final whistle blew the players were met with cheers which capped off an amazing experience for everyone involved. Lincoln then played eventual champions Overseas School of Colombo (OSC) but weren't able to put their chances to bed as OSC ran out 2-0 winners at the end of the game. The next day started with an important game against Lahore American School (LAS), which would decide who would finish second in their group and move on to the quarter finals. Lincoln had the better chances in the first half but weren't able to put them away with Jusung Jung and Nathan Hodgson coming close. As the game came to its end, Lincoln were awarded a free kick just outside LAS's box which was dispatched by Pujen Shrestha to give Lincoln a deserved 1-0 win. In the quarter finals, Lincoln faced the team they played in the finals of the 2014 SAISA tournament - The American International School of Muscat (TAISM). Again, Lincoln created the better chances but weren't able to scored as the final whistle blew. The tension grew with both teams knowing a penalty shoot out would decide their fates. Norchen Lama put up a heroic display in goal saving three of the six shots he faced and helping Lincoln to their fourth semi-final in four years. The semi-finals were met with a great atmosphere with the second largest group showing up since the second day of the tournament. OSC, who looked the team to beat, started well, scoring with the aid of a deflection and through a penalty to put them up 2-0. Lincoln started the second half well, after an inspiring team talk from the Davis brothers, but weren't able to find the back of the net. The loss was hard to take but Lincoln knew they had to pick themselves up for their final match of the tournament against The American International School of Dhaka (AISD). After a closely fought match which ended 0-0, a penalty shoot out was needed to separate the two teams. Norchen Lama again stepped up saving a penalty with AISD missing the target on two other occasions which helped Lincoln to a 3-0 win and third place. OSC beat the American School of Bombay on penalties to win the championship for the first time. This tournament provided a great learning experience for all members of the team and was a great final SAISA experience for others. Lincoln school spirt and support again proved itself to be one of the greatest aspects of the school, and helped push us to our fourth top three finish in four years. Though we didn't defend our title, we were rewarded with memories, lessons and friends that will resonate with us for a life time.